Sharknado may have been a ratings flop, but there are still so many natural disasters that Syfy could mashup with hungry sharks. 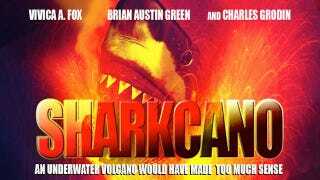 Buzzfeed's John Gara has come up with six movie posters for fishy storms more deadly than a Sharknado. Perhaps rather than sticking to the shark theme, Syfy could mine other fearsome creatures of the deep for their movie storms. Although I guess Box Jellyfishalanche doesn't have quite the same ring to it. Check out the rest of the posters on Buzzfeed.